I Am A Reader, Not A Writer. This hop run from November 15th to 25th and has over 200 blogs participating. We're giving our readers a huge "THANK YOU" for everything you guys do throughout the year. As for our giveaway, we're offering one winner their choice of one book up to $15 from either Amazon or The Book Depository. Our giveaway is open Internationally as a way to say 'Thanks!" to everyone. Yay, I love that its open to whatever book I want. Thanks for the giveaway opportunity. Thank u for the easy entry. And thank u for this giveaway. 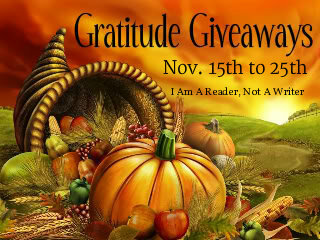 Thank you for the chance to win free books. I am having the same problem with the rafter.